Flair Airlines has started selling seats through Amadeus and plans to further open the agency channel by making deals with other GDS systems. The airline has also revealed plans to launch transborder flights to cities including Las Vegas, Boston and New York. Amadeus users can now book Flair flights, with tickets issued via BSP-Canada and ARC-USA. And around the world, agents can book Flair through an interline agreement with ‘virtual’ carrier Hahn Airlines. "This agreement is the airline's first step towards joining more global distribution systems in the near future," said Mirza Smajic, Flair’s Director of Passenger Sales and Marketing. 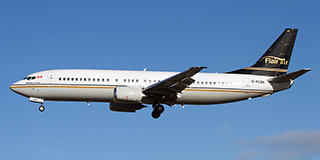 Kelowna-based Flair, a 12-year-old charter carrier which came into the public spotlight after buying discount flight seller NewLeaf Travel, currently operates flights between seven cities in Canada, using five Boeing 737s. The fleet will quickly grow to seven, with new planes arriving in March and June. NewLeaf had initially indicated it would develop a plan to sell through the travel agency channel, but later said the higher distribution costs didn’t work with the ultra-low-cost (ULCC) model. Smajic says the real obstacle for NewLeaf was an old reservation system. Smajic says announcements will soon come about transborder flights, with Las Vegas one destination that will be served both from the west coast and central Canada. New York and Boston are also in the plans, with service from the Toronto area. “We will also be working with tour operators to be able to package our flights with hotels and car rentals,” Smajic says. Flair will also target budget-conscious corporate travellers, by offering fares that offer flexibility and perks for carry-on and checked baggage. “We’re very happy with the way things are developing, and we hope to close next year with at least 1 million passengers,” Smajic told Open Jaw.